Days of Our Lives spoilers reveal there are more casting additions to the soap. 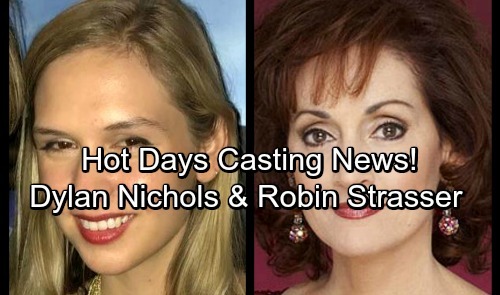 Daytime veteran Robin Strasser and Stephen Nichols’ real-life daughter, Dylan Nichols, are joining DOOL. What can we expect from the characters? Before Louise Sorel was confirmed to return as Vivian Alamain, her good friend Strasser hinted the news on Twitter. Recently, the actress, who is best known as Dorian Lord on One Life to Live sent out a huge clue. Responding to a tweet by Kristian Alfonso, the soap opera icon hinted she could be appearing on DOOL in January 2018. What kind of character could Robin Strasser be playing? Vivian Alamain is showing up in Salem around New Year’s, along with Christopher Tyler’s mystery character. It is possible that Strasser will be playing an evil villainess partnering with Vivian. When Vivian was on the daytime series before, she caused all kinds of trouble. Burying people alive, rolling around on their graves and doing the unimaginable in the name of revenge. Considering Ron Carlivati’s over-the-top writing, expect shocking storylines with some twisted humor thrown in. We can only imagine what kind of scheming Robin Strasser’s character will play. Which characters will she go after and how many lives will be destroyed? Days of Our Lives spoilers also confirm that Stephen Nichols’ daughter is joining the soap. Dylan Nichols’ character was not revealed, but it is probably Stephanie Johnson. It has been a long time since Steve and Kayla Johnson’s (Mary Beth Evans) daughter was seen. There has been a lot of fans wondering if she would return to Salem. Days of Our Lives spoilers imply she will, but what kind of storyline will the writers give her? Although no character name was revealed for Dylan Nichols, she will be seen later this month. Perhaps Steve and Kayla’s daughter can help mend Stayla’s fractured romance. She might be able to clue Kayla in that her anger is misplaced. She will also get a chance to meet her half-brother, Tripp Dalton (Lucas Adams.) Is Stephanie the key to repairing the Johnson family? Keep watching the NBC soap and check back with CDL for the latest Days of Our Lives spoilers, updates and news.